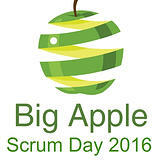 Big Apple Scrum Day 2016 is a one day community conference organized by NYC Scrum User group. Our second conference continues to promote Scrum/Agile values, principles and practices by offering engaging sessions and workshops, free coaching at Coaches Clinic and opportunity to take an active role in sharing the knowledge, discovering new practices, learning from other practitioners and above all - growing Agile/Scrum community. Thank you everyone for submitting your session proposals. With so many great ideas and compelling proposals, we are confident that BASD2016 agenda will be packed with goodness. Feel free to share the registration link with your friends and teammates! Missing Link: Scrum and technical practices. Accepted panel, talk or workshop speakers will receive a complementary conference registration and an invitation to participate in speakers dinner. Accepted lightning talk speakers will receive a 50% discount on conference registration. We are unable to reimburse travel costs associated with the conference. If you have any questions regarding our submission process, please contact us at BigAppleScrumDay@gmail.com.